Followed by talk with Pakistani and UK students, Patrick Hazard and Peter Frazer: Film and Social Change. 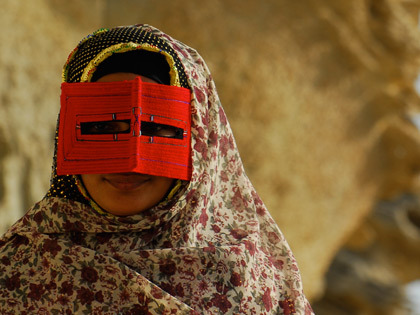 This short documentary takes us behind the Red Burqa masks to reveal the lives of the women who wear them as well as take us on a visually stunning journey across the landscapes of Southern Iran. In June 2006, 1300 women were releaed from jail thanks to a change in a Shariah law on adultery. My Sin follows one released woman as she re-enters a society marred with the politics of women’s sexual morality. Participants looking at installation in vaults. The Kalasha minority in the Hindukush Mountains, NW Pakistan are the last remnants of the shamanistic goat culture that dominated in Centralasian mountain regions before Islam. The UK Media and the War on Terror: Representations and Responsibilities. The intention is to focus on UK media and its reporting of political violence, Pakistan, and the responsibilities involved in such media work within the general context of the ‘war on terror’. More generally, we will addresses the ethics and responsibilities involved in representations of the ‘other’ and explore and contest the notion that a camera is always a tool for enlightenment and empowerment. This event is a series of screenings, debates and installations by young ﬁlmmakers from Karachi. These filmmakers focus on the voices and stories of ordinary Pakistani people, highlighting the issues that are important to them and emphasize their need for change. To read more about the initiative, click here. This film explores the world of juvenile offenders in the ‘Youthful Offenders Industrial School’ in Karachi. Exploring how the ordinary citizen fights against countless stigmas and distorted impressions of Pakistan to find ways to escape. This is the story of Pakistan today where the ordinary people struggle to survive in the face of soaring inflation. Democracy is a dream that is yet to be fulfilled in Pakistan. From Birth to Sixty is a short documentary about Pakistan that aims to debate democracy and political instability in a historical perspective. This workshop has been a tremendously rewarding experience for students and tutors alike. In the UK we tend to have a particular perspective on Pakistan so it’s very important to have these preconceptions challenged and enlightened by young Pakistani filmmakers who have urgent things to say about themselves, their society and their country. The challenge for us is to listen and learn. Additionally, there will be a screening of the winner of the National Short Documentary Film Competition 2009 (a collaboration between the LIDF; the British High Commission, Pakistan; and Geo TV).